ATHENS, Ohio — The Bobcats are off and running. 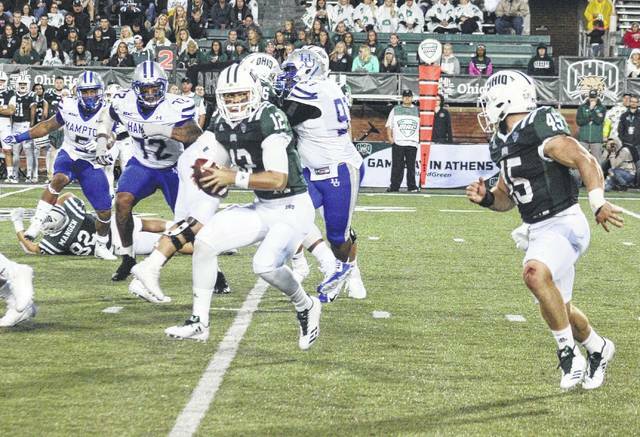 The Ohio University football team rushed for seven touchdowns in a lopsided 59-0 victory over Football Championship Subdivison guest Hampton University on Saturday night at Peden Stadium. 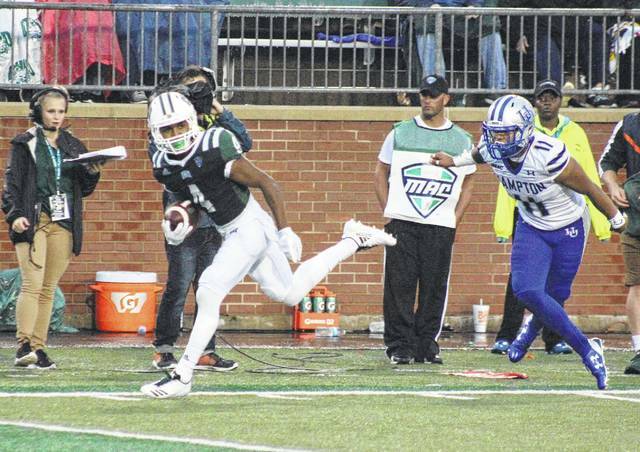 Ohio (1-0) paced itself out of the gate, scoring just once in the first quarter, as redshirt-sophomore quarterback Quinton Maxwell connected with Papi White for a 16-yard touchdown pass. Louie Zervos made the extra-point kick, giving the Bobcats a 7-0 lead just 5:37 into play. Following White’s scoring grab, the Bobcats were held scoreless for over 17 minutes before sophomore quarterback Nathan Rourke found paydirt on an 8-yard run. Less than five minutes later, OU was in the endzone again, as Juilan Ross scored from two yards out. Zervos made one extra-point kick in the second, giving the Bobcats a 20-0 advantage at the half. Less than three minutes into the second half, OU went ahead 29-0 as Dorian Brown’s 10-yard touchdown run was followed by a Zervos extra-point. Just 23 seconds later, the Bobcats recorded a safety. The Bobcats continued to add on during the third period, as Ross and Rourke ran for touchdowns of two yards and 13 yards respectively. Zerovs made both PAT kicks and followed it up with a 38-yard field goal, giving the hosts a 46-0 cushion headed into the fourth. Rourke scored his third touchdown of the day with 12:43 remaining in regulation after scrambling in from 21 yards out. Dylan Wears scored the game’s final touchdown with 6:26 to play with a 9-yard run. Zervos was 2-for-2 on extra point kicks in the fourth as the Bobcats capped off the 59-0 win. Ohio held a 22-7 advantage in first downs and a 420-108 edge in total offense while winning the turnover battle by a 2-1 count. The Bobcats threw the game’s only interception, but recovered two fumbles to finish plus-1. As a team, OU rushed for 248 yards on 53 attempts. A.J. Ouellette led all rushers with 63 yards on 12 carries, while Brown finished with 59 total yards, combining 10 carries and one catch. Rourke — who was 6-of-10 passing for 62 yards — rushed six times for a total of 50 yards, finding paydirt on half of his runs. Maxwell was Ohio’s leading passer, completing 7-of-9 attempts for 100 yards, with one touchdown and one interception. Redshirt freshman Cameron Odom posted game-highs of four catches and 75 yards in the receiving game, while White finished with 35 yards and one touchdown on three grabs. Ohio had not recorded seven rushing touchdowns in a single game since posting a 55-27 win over visiting Eastern Michigan back on October 19, 2002. On defense, Ohio junior Evan Croutch recorded a pair of sacks in the win, while redshirt senior Quentin Poling and redshirt freshman Austin Conrad came up with six tackles apiece. This is the first shut out recorded by Ohio since November 10, 2015. Hampton (0-1) rushed for 47 yards on 32 attempts, while gaining 61 yards on 6-of-24 passing. The Pirates were led on the ground by Chase Powell with 40 yards and Shai McKenzie with 31 yards. HU starting quarterback Delmon Williams was 5-of-15 passing for 51 yards, while Wesley Wolfolk led all Pirate receivers with 38 yards on three receptions. This was the first-ever meeting between the Ohio and Hampton. The Bobcats make their 2017 road debut next Friday when they visit Big Ten Conference member Purdue at Ross-Ade Stadium in West Lafayette. Kickoff is scheduled for 8 p.m.
Ohio University sophomore Nathan Rourke (12) pitches to junior A.J. 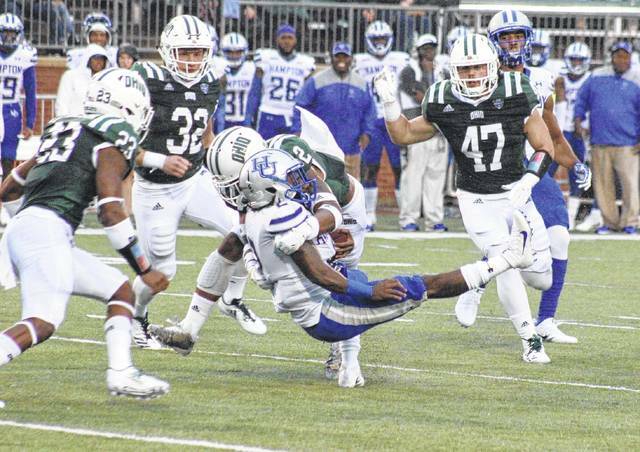 Ouellette (45) on the option sweep during the Bobcats’ season opening victory over Hampton in Athens, Ohio. 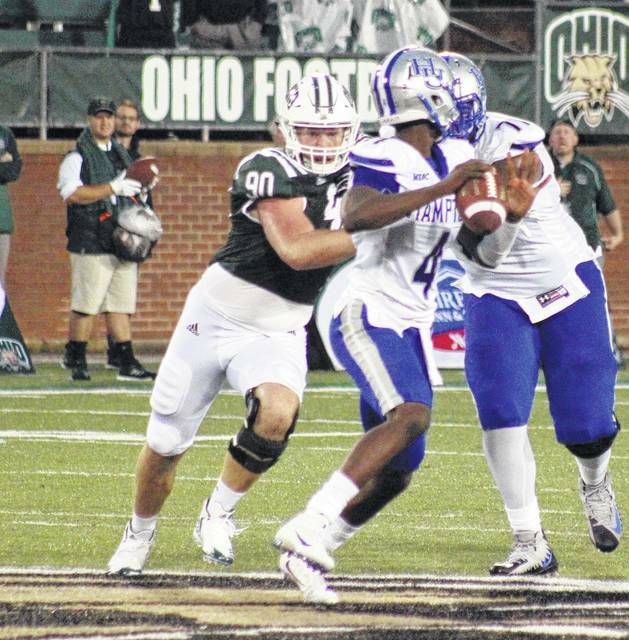 Ohio senior Trent Smart (90) pressures Hampton quarterback Delmon Williams, during the Bobcats’ 59-0 victory on Saturday night at Peden Stadium in Athens, Ohio.